How many times have you been to the dentist to get your teeth cleaned, only to find out that you need to be flossing more? Shouldn’t brushing be enough? Why do you need an water flosser? 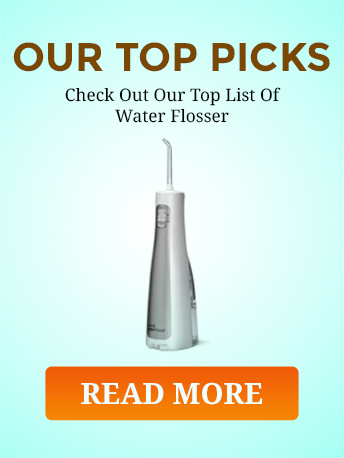 What is the best Waterpik water flosser for you? If using waxed or unwaxed dental floss isn’t quite your bag, water flossing is an excellent alternative to stringing wire between your teeth. Water flossers are an effective and hygienic way to make sure that your teeth are cleaned properly, and most people find that using a water flosser is much more enjoyable than using your standard dental floss. 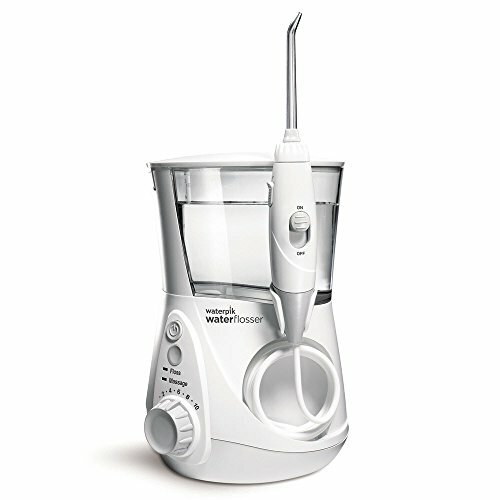 Waterpik Aquarius is an excellent option when it comes to choosing your first water flosser. This water flosser is clinically proven to remove up to 99.9% of plaque from the areas that it is used on. That appears to be pretty standard among the rest of these water flosser options. Waterpik Aquarius water flosser is also twice as effective at removing plaque and bacteria from implants vs. string floss. It is tested to be three times as effective at removing bacteria from teeth that are covered in braces. This unit is AC powered, so it needs to be plugged in so that you can use it. Read the full Waterpik Aquaris review. Waterpick Complete Care with Sonic Toothbrush promises healthier teeth and gums within 14 days of use. The great thing about this set is that it includes a nice toothbrush with replaceable brush heads, and a travel case for the tooth brush. Here are some of the features of the waterpik complete care water flosser and sonic toothbrush. 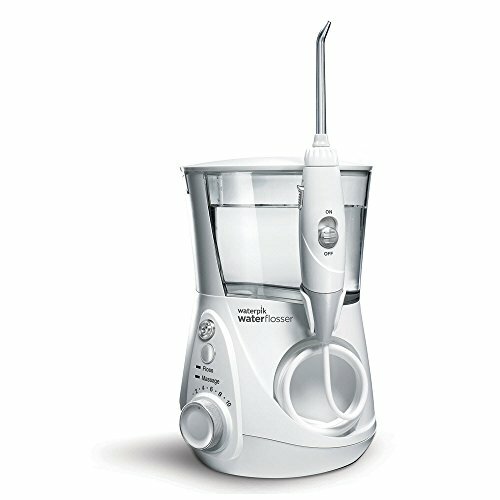 This model claims the same percentage of plaque removal as the Waterpik Aquarius, and also boasts that their package is up to 159% more effective than just using a manual toothbrush for cleaning your teeth. 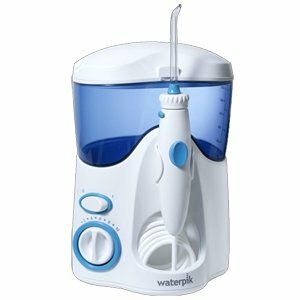 This Waterpik dental water flosser is another great choice when it comes to selecting the right water flosser for you. It’s compact design makes it perfect for sitting on your sink top, without getting in the way by taking up too much space. 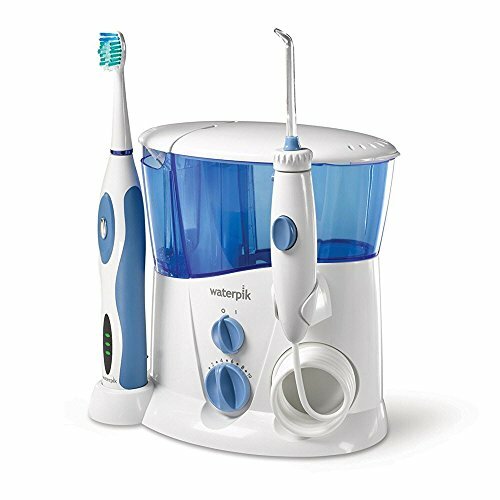 The Waterpik WP100W Ultra Dental Water Flosser is also AC powered, so you need to make sure that it is near a power outlet in your bathroom. Contact the manufacturer for details on the warranty of this product. This unique flosser is another sleek, compact addition to your teeth cleaning repertoire. A nice little touch for this particular water flosser is that it comes in four different colors, and satin and chrome accents so that you can floss your teeth in style. 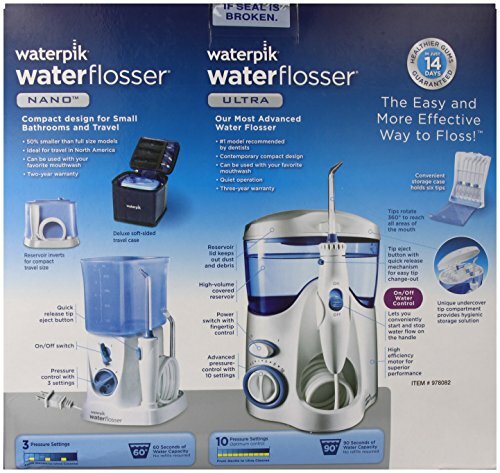 Here are some of the features of the Waterpik Aquarius Professional Water Flosser Designer Series. This flosser and combo pack is another great, compact choice for keeping a water flosser around the house. The best aspect of this particular water flosser unit, is that it comes in two different sizes. One has more features and functions and is perfect for the home, and the other is a compact model that you can store in your luggage and take with you while you are traveling. The main feature that this water flosser toutes is a durable, storage and transport case so that you can take your water flosser with you wherever you go. Here are some of the key features of the Waterpik Water Flosser Tip Storage Case and Accessory Tips Combo Pack. The travel unit is 50% smaller than full-sized models, which makes it great for tucking in your suitcase, backpacks, or carry-on bags. This unit offers a lot in terms of versatility, functionality and portability. 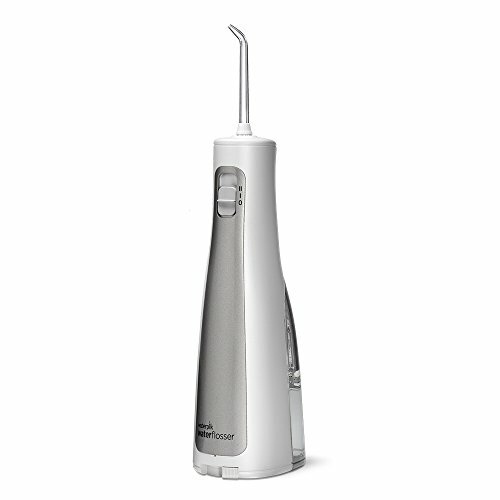 For better flossing on the go, the WF-03 from Waterpik is an excellent addition to any traveller’s toiletry bag. This unit is both cordless and waterproof, meaning it can easily be used in the shower. If you have not used a water flosser to clean your teeth before, you may not fully appreciate the value of being able to run the device in the shower. Having a waterproof flosser makes properly cleaning between and around your teeth with a handheld jet stream of pressurized water in your mouth a lot easier. Running on three AA batteries with an included starter set, this little handheld model gets your teeth and gums clean, and because of its cordless design it makes reaching hard to clean areas of the mouth much easier. It also comes with a travel bag to hold the charger and cleaning tips. Two considerations that need to be made, though: the limited water capacity, and the limited number of cleaning tips. This model only includes three tips, potentially limiting its effectiveness for all users. Also, the limited water capacity means you may need to pause for refills more frequently. Overall though, you could not ask for a better travel waterpik to keep your teeth and gums clean and healthy while away from home. While not strictly a waterpik, this is an effective travel solution for when you are away and still need a solid-performing flosser. Instead of water, this device uses a soft, flexible nylon tip to slip between teeth and gums and remove buildup and debris. The brush is capable to cleaning right up to the very back of the gums, and brushes away tartar and plaque at 10,000 strokes per minute. Requiring just one AA battery, this model is very compact and portable, making it ideal for cleaning hard to reach areas of the mouth. Replaceable tips can last anywhere from 1-3 weeks of regular use, making it as economical as it is practical. There are a couple of considerations that must be made when using this model, however: first, you will need to rinse with water and mouthwash to eliminate any remaining debris, and this model is not waterproof, meaning it cannot be used while in the shower. While these may seem like minor inconveniences considering the minimal price point, it is important to keep them in mind when purchasing a portable flosser. After taking a look at some of the best Water pik flossers that you can find, I have some thoughts in closing. Personally, the Waterpik Aquarius seems to be the best bang for your buck when it comes to features and functionality for the price. My other favorite was the Waterpik Water Flosser Tip Storage Case and Accessory Tips Combo Pack, because of the portability options that the smaller unit offers. If you hate flossing and travel a lot, this is the unit for you. The variety of tips that are offered in each of these sets make them suitable for a wide variety of dental layouts, and work really well with braces, implants, crowns, and periodontal pockets. Looking at all of the features is important in knowing if you are going to want something simpler, or a model with all of the bells and whistles. At the end of the day, if you have a hard time incentivizing yourself to pull out the strings of dental floss, I would highly recommend getting yourself any good water ter flosser. They save time and in general, are very easy to use and keep up with. If you are going from not flossing at all to using a water flosser daily, you are going to see dramatic improvements in your smile and oral health within weeks of consistent use. Remember tho, regular brushing is absolutely necessary for keeping your teeth clean, your gums clean, and your breath fresh. Brushing, when done correctly, is an excellent way to remove the bacteria on the outside of your gums and teeth. The only downside to brushing, is that your bristles aren’t really designed to get down into the nooks and crannies between your teeth. That’s where flossing comes in. Dental floss is used to remove the bacteria in those hard to get spaces between your teeth. Though flossing isn’t any more time consuming than brushing, it can be annoying to do one more thing after brushing your teeth. You are really selling your oral health short if you are still refusing to floss your teeth. To make sure that you have a healthy mouth and prevent plaque buildup and gum disease, you need to make sure that you are brushing and flossing daily. I really hope that my list of Best Water Pik Water Flossers helped someone make a choice.